July 12, 2011  Mississippi Attorney General Jim Hood is suing BP oil spill fund administrator Kenneth Feinberg, in an attempt to force open the books at the Gulf Coast Claims Facility. April 20, 2011  In the first hour of Talk of the Nation, the political junkie, and tracking a drug submarine. In the second hour, the murky legality of online gambling, and the one year anniversary of the BP oil spill. 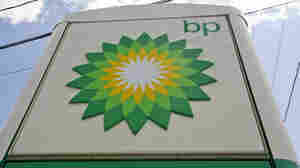 March 3, 2011  BP will not give bonuses to two executives who ran the oil giant's Gulf of Mexico operations last year: former CEO Tony Hayward, and the former head of exploration and production Andy Inglis. November 1, 2010  The number of rejected claims for compensation for damage from the BP Gulf of Mexico spill spiked in October -- to 20,000 from just 125 claims at the end of September. Kenneth Feinberg says many lacked crucial information. October 28, 2010  Before the massive blowout of BP's Macondo oil well in the Gulf of Mexico, tests showed that the cement Halliburton pumped down into the well could be unstable, according to a presidential commission studying the Deepwater Horizon spill. October 20, 2010  Obama seems to have escaped deep lasting damage from the BP oil spill which once seemed unlikely. But the president may have helped his critics' narrative that he's killed jobs with his moratorium on Gulf oil drilling. August 13, 2010  BP must complete its relief well after leaking was found from an earlier try to kill its rogue Gulf of Mexico well. The use of a relief well is the energy industry's textbook method for killing an uncontrolled gusher. August 6, 2010  An Obama operative didn't create the vanishing Gulf oil report, according to NOAA. His name was mistakenly included in the report as its creator due to a "technical glitch," AP reported. July 19, 2010  BP said seepage on the sea floor a few miles from the broken well is natural. July 14, 2010  After a government-requested delay, Obama's team told BP to test a new cap on its rogue Gulf well. June 23, 2010  BP removed the cap collecting oil spewing from the broken well in the Gulf of Mexico after a remote sub bumped into it. June 23, 2010  U.S. District Judge Martin Feldman, who sided with the energy industry against the Obama Administration's temporary halt of deepwater drilling, has been criticized for his past oil and gas-related investments. June 22, 2010  The ruling by a federal judge to end the Obama administration's moratorium on drilling in the Gulf pleases Republicans, but the White House promises an appeal.